A little detail of the second layer of chinelogs installed some days ago. Now epoxied in place. Glassing the sidepanels before applying them to the superstructure. This task proved a bit difficult, as we have a very thick fabric, which did not want to soak in the glue. Prewetting the surface below helped a lot. This is it, roughly 300 kg of lead. Does not look much, but it certainly feels much when lifting it. We dragged this lot into the garage with 3 or 4 sessions. Very soft, very heavy, fery unearthly. Drawing those fillets takes some time to hone, but it all works out for the best. Anyways, epoxy is good, since when you cut wrong, epoxy comes to aid and replaces the missing part. The gunwale stringer can be seen, as the overall progress so far. 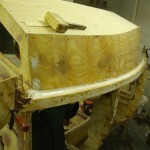 Uku glass-taping and filleting the cabin after the portside window-panel was installed. 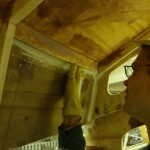 This entry was posted in Building blog and tagged cabin, chinelogs, gunwale, stringers. Bookmark the permalink. I had liked the John Welsford designs especially the Scamp and Houdini sailboats for space in my garage. I also thought the Farfnir was a really cool boat so I was excited to find your blog on the build. 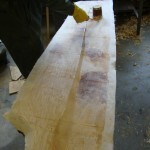 I was always interested in what types of wood to use, because like you I love cash (money) but do not have much of it. So to see the results of your test on more common building materials is very interesting to me. I enjoyed reading your thoughts on different woods that you have used or tried out. Good luck and I live in Orlando Florida and I would like to build the Scamp sailboat as a first build. 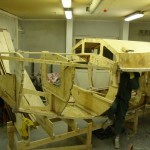 I have started following another blog of a Scamp build this young lady just started her build. Her blog page is wishingbee.blogspot.com she has other interests on this blog as well. I think I will be able to learn alot (your trials and errors) before I begin and get a better understanding and confidence on working with wood. Hello! Good to know that our output has an audience. I’ll give you a quick thought on materials and money: get the best glue and the best plywood. It will save you time and money. But this comes with a hook. 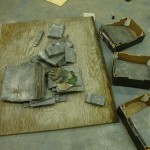 To exploit the good stuff to the max you need some previous experience with lesser materials. We have come to this conclusion over time, as our practice hours have gone up. So, if it is your first time building, then proceed with lesser quality and progress to the good stuff with your next project. We will keep updating, haent done for a while on the details page, for example the steamer rig, which works wonderfully with only one kettle connected. 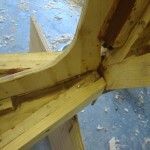 Further we have new information on knotholes and treating them on low grade stringers.